Andean Handcrafted Gold Vermeil Earrings with Crystal Quartz, "Touch of Radiance"
Faceted crystal quartz brings a touch of radiance to any ensemble in earrings by Marianela Vargas. Set in luxurious gold vermeil, the gemstones total 14 carats. 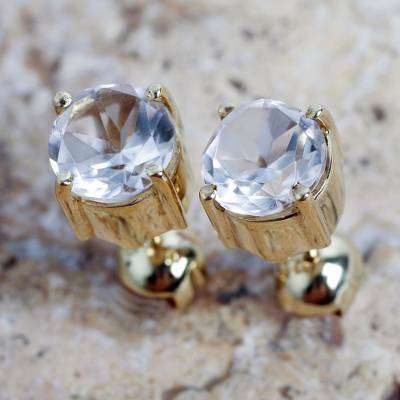 You can find gold vermeil quartz stud earrings 'Touch of Radiance' by Marianela Vargas in jewelry categories such as Birthstone Earrings, Quartz Earrings, Gold Earrings, Vermeil Earrings, Gold Earrings, Gold Plated Earrings, Silver Earrings, Sterling Silver Earrings and Stud Earrings. Enjoy exploring these sections for other Novica treasures.